Bixby Vision detects images and gives you the information you need. It finds products online, searches for similar images, shows notable locations nearby, translates text, reads QR codes, and more. Bixby Vision can be executed via Camera, Gallery, Samsung Internet, Air command (S-pen), Smart capture or at the Home screen. Using the data, app developers can create more value-added services while leveraging real-time information from the framework. Using the data provided by the Bixby Vision Framework saves the effort spent in training, optimizing, and accelerating neural-network models for commonly used functions. Also, it allows BV Vendor App developers to run their own models and vision functions on the device or on the cloud for differentiated functionality. In the case of a third-party BV Vendor Apps, the processed information can be returned back to the framework for displaying it in real-time during the camera preview operation, or as a card with a static background. Further user interactions related to the selected object can be handled by third-party BV Vendor Apps depending on the type of application, and its bindings with framework. PartialBinding – The BV Vendor App can be launched with its own UI when the user selects any object. LinkBinding – BV Vendor App can be launched by the Samsung BV App. It has its own UI and is not dependent on the BV FWK for its operations. Sign up for a Samsung account, if you do not already have one. 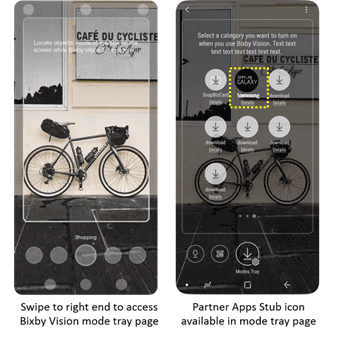 Develop an application using Bixby Vision SDK and register it in the Galaxy Apps and Bixby Vision. READ CAREFULLY BEFORE USING THE SDK: THIS SDK LICENSE AGREEMENT (“AGREEMENT”) IS A LEGAL AGREEMENT BETWEEN YOU(“LICENSEE”) AND SAMSUNG ELECTRONICS CO., LTD.(“SAMSUNG”) AND IS EFFECTIVE UPON YOUR ACCEPTANCE. BY CLICKING ON THE “I AGREE” BUTTON, INSTALLING, COPYING OR OTHERWISE USING THE SDK, YOU AGREE TO BE BOUND BY THE TERMS AND CONDITIONS OF THIS AGREEMENT AGREEMENTAND REPRESENT AND WARRANT THAT YOU HAVE AUTHORITY OR HAVE BEEN PROVIDED THE AUTHORITY TO BIND THE LICENSEE TO THE TERMS AND CONDITIONS OF THIS AGREEMENT. IF YOU DO NOT AGREE TO THE TERMS AND CONDITIONS OF THIS AGREEMENT, DO NOT CLICK ON THE “I AGREE” BUTTON AND DO NOT INSTALL, COPY OR USE THE SDK. "Affiliate" shall mean any corporation or other entity that controls, is controlled by, or is under common control with a party (a corporation or other entity shall be deemed to control another if it owns or controls more than fifty percent (50%) of the voting stock or other ownership interest of the corporation or entity). "SDK" means Samsung SDK, which includes the APIs, applications, Documentation, data, files, libraries, materials, IDE (Integrated Development Environment), Sample Code, software (source code and object code), simulators and tools provided or made available to Licensee by SAMSUNG pursuant to this Agreement for use in connection with the development of Applications, including any Updates that SAMSUNG may provide or make available. For the purpose of clarity, SDK is SAMSUNG’s proprietary information and software is considered neither as open source nor in the public domain. 4. (d) any software licensed under the Academic Free License, Apache Software License, the Artistic License (e.g., PERL); Berkeley Software Distribution License; Eclipse Public License; GNU’s General Public License; GNU’s Lesser/Library GPL; MIT License; the Mozilla Public License; the Python License, the Sleepy Cat license, the Sun Community Source License; or licenses approved by the Free Software Foundation or the Open Source Initiative. 2. Grant of SDK License and Restrictions. 2. (b) make a reasonable number of copies of the Documentation and distribute such copies to Authorized Users for internal use solely for the purpose of developing or testing Applications. (d) Applications must comply with all applicable laws and regulations (including the laws and regulations of any jurisdiction in which the Applications are offered or made available) and SAMSUNG’s internal policies and regulations. In addition, in respect of any Application that may collect, transmit, maintain, process, share, disclose or otherwise use personal information, location information, or other data that relates to a user ("User Information Handling"), Licensee shall comply, and the Application must be compliant, with all applicable privacy and data collection laws and regulations with respect to such User Information Handling. Licensee must ensure that any processing or transmission of the end user data is conducted in a manner that preserves the accuracy and security of the data. Licensee must not design or market Applications for the purpose of violating any legal rights of any person (including but not limited to privacy rights). (e) Application must not contain any material, component, or code which might damage, destroy, unduly burden or adversely affect software, firmware, hardware, data system, services or networks. (f) Applications must not disable, override or otherwise interfere with any SAMSUNG-implemented system including, but not limited to, those that are intended to notify a user that the user's location data is being collected, transmitted, maintained, processed or used, or intended to obtain consent for such use. Applications may not provide services for which the user's consent has been denied or withdrawn. (g) If an Application includes any Third Party Software, Licensee must comply with all licensing terms applicable to such Third Party Software. However, Licensee shall separate the portion of the Third Party Software from the portion of the SDK in Licensee’s Application and shall not cause the portion of the SDK in Licensee’s Application, any derivative works thereof, and/or SAMSUNG’s Confidential Information to be subject to the licensing terms applicable to such Third Party Software (e.g., public disclosure, public distribution). Licensee shall indemnify, defend and hold harmless SAMSUNG, its distributors and its customers from and against any and all claims, demands, damages, costs or expenses (including reasonable attorney’s fees) and liabilities arising out of or in relation to the use of Third Party Software. (h) Applications may be rejected if they contain content or materials of any kind (including, but not limited to, text, graphics, images, photographs, sounds, etc.) that SAMSUNG reasonably determines to be objectionable (for example, materials that may be considered obscene, pornographic or defamatory). (j) Licensee shall promptly respond to SAMSUNG regarding the use of policies and APIs in connection with the Application and/or SDK, upon SAMSUNG’s request. (k) Licensee warrants that the use of Licensee’s Application does not and will not infringe the intellectual property rights, or other proprietary rights of any third party and shall immediately notify Samsung in the event of any such infringement. (l) Licensee warrants that the Application is free from material errors and defects. Licensee warrants that the Application has been designed and developed for installation and operation solely on the devices that have been fully tested and approved by Samsung. (m) Licensee acknowledges and agrees that in connection with Licensee’s use of the SDK, Samsung may collect and use information about the Application and use of Application. Licensee shall obtain all consents from the users of the Application necessary for Samsung to use the foregoing information for the purpose of improving SDK and for providing services, if any, related to the SDK. For the purpose of clarity, Samsung reserves the right to charge for use of the SDK in the future. (c) Licensee will be solely responsible for all activities Licensee and the Authorized Users undertake in connection with the SDK, the Applications and the development of Applications; and. (d) all information provided by Licensee to Samsung is and will be accurate, current, complete and true. (c) Licensee agrees that Licensee is solely responsible (and that SAMSUNG has no liability or responsibility to Licensee or to any third party) for any breach of Licensee’s covenants and obligations under this Agreement or any applicable laws and regulations, or for the consequences of any such breach (including any loss or damage which SAMSUNG or any third party may suffer). SUBJECT TO TERMS AND CONDITIONS OF THIS AGREEMENT AND TO THE FULLEST EXTENT ALLOWED AND PERMITTED BY APPLICABLE LAWS AND REGULATIONS, SAMSUNG SHALL NOT, UNDER ANY CIRCUMSTANCES, BE LIABLE TO LICENSEE OR ANY THIRD PARTY THROUGH LICENSEE FOR PERSONAL INJURY OR ANY CONSEQUENTIAL, EXEMPLARY, INCIDENTAL, INDIRECT, PUNITIVE OR SPECIAL DAMAGES WHATSOEVER, INCLUDING, WITHOUT LIMITATION, DAMAGES FOR LOSS OF PROFITS, LOSS OF DATA, BUSINESS INTERRUPTION OR ANY OTHER COMMERCIAL DAMAGES OR LOSSES, ARISING OUT OF OR IN RELATION TO THIS AGREEMENT, LICENSEE’S USE OF THE SDK, OR LICENSEE’S DEVELOPMENT OF APPLICATIONS, WHETHER BASED ON BREACH OF CONTRACT, BREACH OF WARRANTY, TORT (INCLUDING NEGLIGENCE), PRODUCT LIABILITY OR OTHERWISE, EVEN IF IT HAS BEEN ADVISED OF THE POSSIBILITY OF SUCH DAMAGES AND NOTWITHSTANDING THE FAILURE OF ESSENTIAL PURPOSE OF ANY REMEDY. LICENSEE’S UNDERSTSANDING, ACKNOWLEDGEMENT AND ACCEPTANCE OF THIS AGREEMENT ARE THE LEGAL BASIS AND CONSIDERATION FOR THE LICENSES GRANTED UNDER IT. (c) by either party for any reason or no reason upon thirty (30) days prior written notice to the other party.